There is no better feeling than smooth, easy airflow through the nose. One very common barrier to this is a deviated septum. This is a condition in which the septum—the part of the nose separating the two nostrils—is askew. This prevents proper airflow, often prompting facial pain, headaches, postnasal drip and other uncomfortable symptoms. Fortunately there is a procedure that can adequately correct this condition, known as a septoplasty. Performed with Dr. Aminpour's expertise, patient's uniformly get total relief from any lack of nasal function caused by a deviated septum. Dr. Aminpour posesses years of expertise and training, allowing him to get his procedures right the first time, thus significantly lowering the need for revision rhinoplasty in Los Angeles. All too often does he receive a patient that is need of revision rhinoplasty due to a prior surgeon's mistake. Be sure to take this into consideration when selecting your nose surgeon. A septoplasty is a surgical procedure performed to correct a deviated septum, the central structure of the nose that separates the nostrils. The septoplasty is performed to straighten the bones and cartilage of the septum so that obstructions are removed from the breathing passages. Those with a deviated septum are more likely to have trouble with snoring, sleep apnea and sinusitis. These symptoms are virtually eliminated following a septoplasty. Many people with a deviated septum have difficulties breathing. This may include feeling congested or “stuffy” frequently, even when there seems to be no specific cause such as a cold or allergies. This feeling can force patients to breathe through their mouths, which can be uncomfortable and cause the mouth to feel overly dry. At night, people with deviated septums may have even further difficulties breathing, which can cause them to wake up frequently or toss and turn so they never feel completely rested. Correcting a deviated septum with a septoplasty results in the freedom to breathe and live more comfortably. Because the airways are no longer blocked by displaced bones or cartilage of the septum, air flows more easily. This allows patients to breathe through their nose rather than through their mouth, which can make them more comfortable during the day and at night. Breathing easily throughout the night can contribute to a much sounder sleep so you wake up fully rested. Because Dr. Aminpour is double board certified as an otolaryngologist—ear, nose and throat specialist—and a facial plastic surgeon, he is uniquely qualified to provide among the best septoplasty Los Angeles has to offer. If you have ever considered changing the appearance of your nose, it may be a good idea to consider getting both a septoplasty and a rhinoplasty at the same time. Fusion rhinoplasty enables you to get both the functional and the aesthetic results you would like without undergoing multiple surgeries and multiple rounds of anesthesia, not to mention multiple payments. You will not only be able to breathe more easily, but you will also experience a precise and delicate improvement in the appearance of your nose. 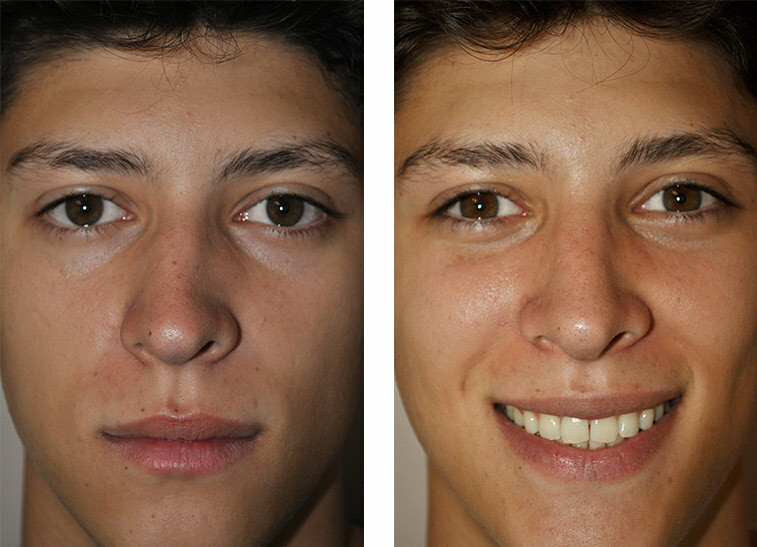 In an effort to deliver the best septoplasty Los Angeles has to offer, Dr. Aminpour follows a customized surgical plan for each patient undergoing septoplasty. Typically this involves lifting the mucous membrane away from the septum in order to straighten the nasal bones and cartilage. In some cases, selections of cartilage and bone will need to be removed to ensure the nasal structure will not shift back into a position that blocks airflow. Deviated septum surgery is usually performed under general anesthesia but can be performed under local anesthesia in some special cases. If you do not want general anesthesia or have a medical condition that would prohibit it, be sure to discuss options for local anesthesia during septoplasty with Dr. Aminpour in his Los Angeles surgical center. Most deviated septum surgeries take about an hour to perform. Septoplasty is normally performed as a “closed” procedure in which the nostrils remain intact and closed and small instrumentation is inserted through the nostril to execute the surgery. If you choose to undergo both a functional septoplasty and cosmetic rhinoplasty at the same time, the procedure will most likely be “open,” where a small incision is made across the cartilage in the center of your nose that separates the nostrils to provide access to the entire nasal structure. As an outpatient surgery, patients can return home the same day as their septoplasty. The nose may be splinted internally to support the septum. Internal packing is not usually used after a septoplasty and because the procedure is generally performed through the nostrils, there is usually no external scarring. Recovering after a septoplasty procedure is relatively similar to the rhinoplasty recovery process. The day following your septoplasty surgery you can expect to be tired and drowsy and have soreness and nasal drainage. There will also be swelling as a result of the nose surgery. This usually dissipates in about a week, at which point you should be able to breathe more easily. External bruising is not typical if you are receiving only a septoplasty and not undergoing any additional cosmetic or functional procedures. Results will stabilize in 3 to 6 months, though it may take 12 to 18 months for swelling after septoplasty to fully reduce. If you're looking at receiving septoplasty, your next step is to schedule a consultation with Dr. Aminpour in his Los Angeles office. Dr. Aminpour is highly trained: a double-board certified rhinoplasty surgeon in Los Angeles, with a special emphasis in ear, nose and throat.